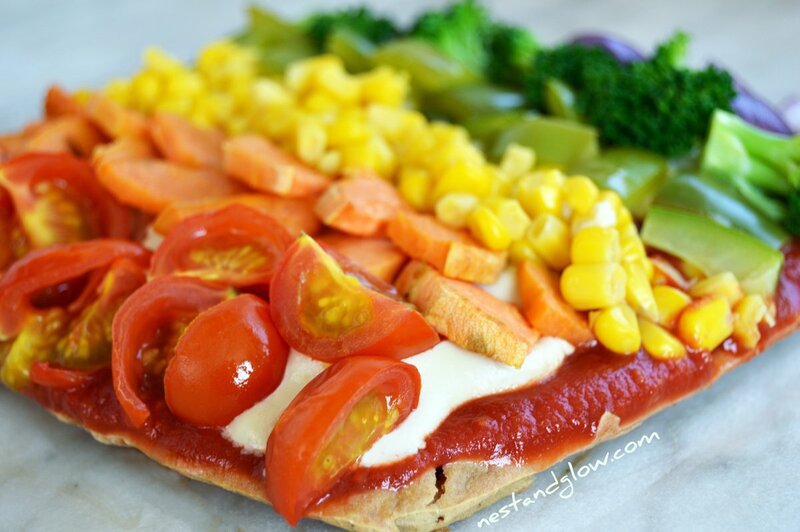 This rainbow pizza has a quinoa crust and cashew cheese. Everyone seems to love this pizza so it’s not just for people following a gluten-free, vegan and grain-free diet. The pizza is high in plant based protein – once slice gives you over 10 grams so is a great vegan protein meal. 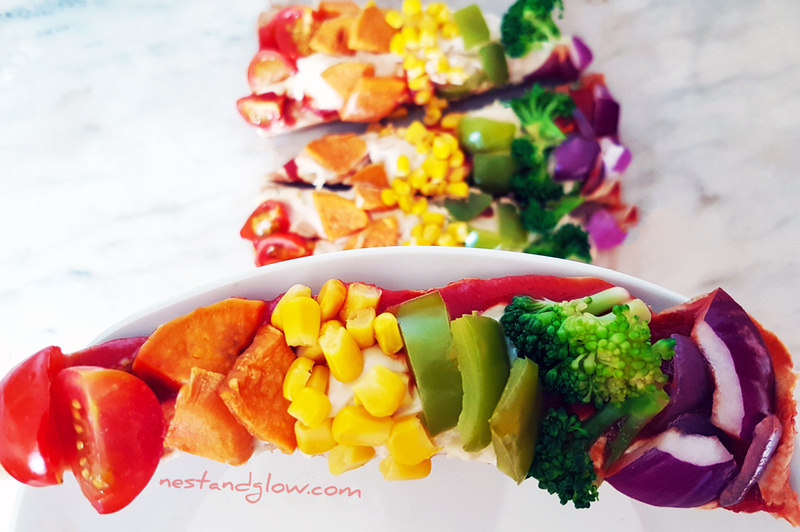 As you are supposed to eat a rainbow diet what can be a better way than this healthy rainbow pizza? Soak the quinoa for at least 15 mins, 6+ hours is best. Line an 8″ square pan with greaseproof paper or just use a silicon pan and pour in the quinoa batter. Heat gently while stirring constantly to stop the bottom from burning. It’s ready when it’s thick and gooey and rolls off the spoon slowly. Spread the tomato passata over the base, then blob on the cashew mozzarella and layer on the rainbow toppings. Place back in the oven for 5 mins to cook the toppings and brown the cheese. 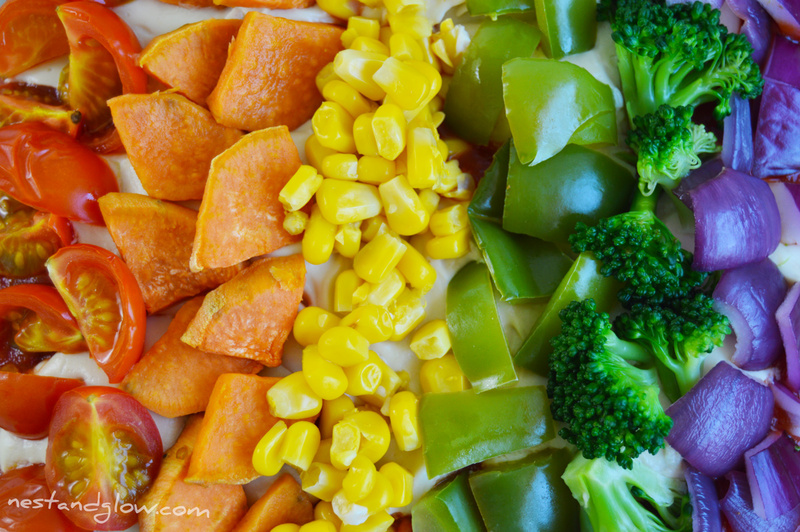 You can top with any fruit or veg that you like to get the rainbow effect. I couldn’t find any orange peppers or tomatoes so ended up using sweet potato. It was less than ideal as I needed to steam it first, but still it looked and tasted great. Corn starch can be used in place of the tapoica to make the cheese. It won’t be quite as stringy and will mean it isn’t grain-free but will still be just as delicious. This was heavily inspired by a pin on Pinterest however the original was not vegan so I decided to nestandglow this recipe to make it dairy and egg free. I did try to add blue to the pizza using boiled red cabbage. The cabbage did go blue after several attempts but it really didn’t look appetising so after two attempts I gave up. The third and final quinoa pizza base baked that day is the one used for all the photos and video recipe. If you like the sounds of this pizza but prefer them with less topings then check out my Cashew Mozzarella Quinoa Crust Pizza Recipe.